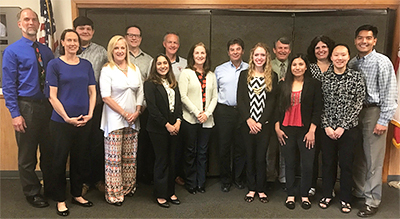 The El Dorado County Youth Commission met with El Dorado County Office of Education Superintendent of Schools, Dr. Ed Manansala, members of EDCOE leadership, and members of the County Board of Supervisors on Monday, May 15. The students held their annual pasta dinner with the dignitaries to share the focus of their work this school year and to get feedback from Supervisors and EDCOE representatives, which jointly sponsor and support the Youth Commission. The Youth Commission gives students the opportunity to be involved with their community and make a positive difference, while developing leadership and governance skills. “Our youth hold the keys to a bright future, so the Youth Commission plays a vital role in developing the leaders of tomorrow,” noted Dr. Ed Manansala, County Superintendent of Schools. Students decided that the resources are available, but students can have trouble finding that information. “Our goal has been to find the best resources out there and put live links to those resources in one place. When we have the information gathered, we will promote the website through high school counselors, teachers, and other community groups,” said Vice-Chair, Joseph Goulart.